Sen. John McCain made a major effort to win South Carolina primary, hoping to benefit from the state's large veteran population. McCain visited the state frequently and his campaign organized steadily throughout 1999. On Feb. 19, 1999 the campaign announced it was hiring Richard A. Quinn and his firm Richard Quinn & Assoc. as chief political strategists for South Carolina. On June 4 Reps. Lindsey Graham and Mark Sanford joined as state co-chairmen (Speaker Pro Tem Terry Haskins was also co-chair). By July 29 McCain had announced the formal opening of his office on Gervais Street in Columbia; it had been working out of part of Quinn's offices for some months. Also during the summer Jim Merrill became state director. On Oct. 12 the campaign announced county chairs in all 46 counties. Further South Carolina experience came from McCain's national field director Trey Walker who had served as executive director of the South Carolina Republican Party for almost six years. Thus not only were the fundamentals in place, but McCain came into the state with momentum from his thumping of Governor George W. Bush in the New Hampshire primary. South Carolina has in past GOP primaries served as a "firewall" for frontrunners, and unfortunately for McCain the firewall held. Bush too had a strong organization in the Palmetto State. The campaign opened its headquarters on Devine Street in Columbia on June 14, 1999; Heath Thompson, who served as chief of staff to Lt. Gov. Bob Peeler and ran his reelection campaign in 1998, was state director. Peeler and House Speaker David H. Wilkins served as co-chairs. Bush enjoyed the backing of all three former Republican governors and Sen. Strom Thurmond among others. After the New Hampshire drubbing, Bush rejiggered his campaign, becoming the "Reformer with Results" and doing the town meeting question and answer format that he had eschewed in New Hampshire. A few mistakes cost McCain dearly. For a time in February his campaign ran TV spots comparing Bush to President Clinton, a severe insult among Republicans. (In "Trust" the announcer asked "Do we really want another politician in the White House America can't trust?" and in "Desperate" McCain himself stated, "His [Bush's] ad twists the truth like Clinton.") This allowed Bush to defend his integrity and hit back at McCain. Then, during the Feb. 15 BIPEC debate McCain flatly denied a flyer was his that was in fact produced by his campaign. Finally, whereas Bush was taking citizens' questions, McCain seemed to be going the other direction, toward staged rallies. Perhaps the campaign and the candidate were simply exhausted from their New Hampshire effort. In any event, what had been seen as a tight contest turned out to be a fairly easy win for Bush. Bush fared particularly well in the Greenville-Spartanburg area, while McCain's strongest showing came from the counties along the coast. Alan Keyes had an active campaign in South Carolina; Hal Stevenson served as state chairman and Jennifer Hill as state coordinator. The campaign was headquartered in the same building as Stevenson's offices on Lincoln Street in Columbia. Steve Forbes' and Gary Bauer's campaigns had shut down by the time the campaign came to South Carolina. (Terry Sullivan served as Forbes' state director and Tony Denny was senior advisor. State Sen. Mike Fair of Greenville was Bauer's state chairman). Elizabeth Dole and Dan Quayle had also been active in the state but had withdrawn months earlier. (Dole had opened an office in the Lake Murray area outside of Columbia on Oct. 13, 1999 just before she withdrew from the race; State Sen. Andre Bauer served as her state director. Jim Merrill headed Quayle's South Carolina effort before switching to McCain). 1. 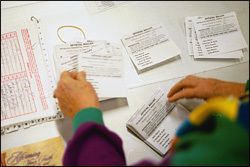 Candidate withdrew before primary but was on ballot. CD-1, which includes Charleston and Myrtle Beach, is represented by Mark Sanford, one of two congressmen who endorsed Sen. McCain. It was the only congressional district McCain carried, accounting for his 3 delegates. CD-2 ranges from Columbia to Hilton Head Island and is represented by Floyd Spence. CD-3 covers 10 counties in the western part of the state and is represented by Lindsey Graham, the most prominent of McCain's South Carolina supporters. CD-4 covers the Greenville/Spartanburg area and is represented by Jim DeMint. Gov. Bush fared best in this district, thumping McCain by a 58.4% to 35.4% margin. CD-5 is a rural district on the north-central border of the state; the largest cities are Rock Hill and Sumter. Democrat John Spratt represents the district. CD-6, in central South Carolina, is represented by James E. Clyburn, a Democrat. Gov. Bush won in 38 of South Carolina's 46 counties. He obtained more than 60% of the vote in 10 counties. Key counties in Bush's win were his strong showings in Greenville (58.47% of 73,281 votes cast) and Spartanburg (58.49% of 37,159 votes cast) counties as well as Lexington (57.40% of 45,277 votes) and Aiken (55.64% of 23,701 votes) counties. Sen. McCain won in all four coastal counties--Horry (53.23% of 27,735), Georgetown (49.68% of 7,458), Charleston (49.75% of 47,269) and Beaufort (53.16% of 21,212), in the sparsely populated counties of Abbeville, Chester and Marlboro, and in the westernmost county of Oconee (McCain backer Lindsey Graham hails from Seneca in Oconee County). Alan Keyes' best showings were in three urban counties: Richland (7.25% of 44,811), Lexington (6.57% of 45,277) and Greenville (6.46% of 73,281). 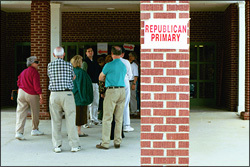 Turnout was huge, more than twice the previous record of 276,741 votes cast in the 1996 GOP primary.